Sony S-AIRPLAY AIR-SA20PK Wireless iPod Dock - S-AIRPLAY, 2 Receivers/Speakers, AM/FM Tuner, Volume Control, LCD Display, Remote Control at CircuitCity.com. 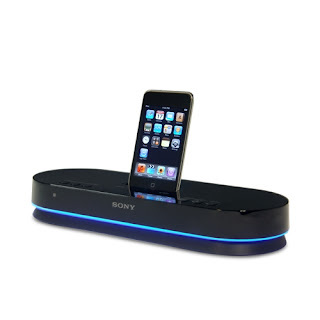 This Sony S-AIRPLAY AIR-SA20PK Wireless iPod Dock is a plug-and-play system that lets you enjoy your iPod® music out loud throughout your home. Simply plug the two supplied AIR-SA15 receiver/speakers into a power outlet and the included S-AIR Dock for iPod transmits your stored music with CD-quality sound throughout your home. It is even capable of transmitting 2 signals simultaneously so that one speaker can play your iPod music while the other plays an AM/FM radio station. The S-AIR PLAY is compatible with most iPod models. Additionally, each speaker includes controls for volume and the audio source, an LCD display that lets you view track info, and a convenient clock and alarm.